Suffice it to say, almost anyone who knows drums knows Tama. But for those of you new to drumming, here's a brief intro: Tama is the drum brand of Hoshino Gakki in Japan. 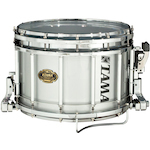 We started manufacturing drums in 1965 and officially became Tama in 1974. For decades Tama's focus has been on drum sets and accessories. Tama's history is marked by a steady stream of invention and innovation, much of it imitated by competitors. As a whole, Tama's continual innovative efforts result in an ongoing trifecta of superior sound, solution-driven hardware, and pro-level durability. Fast forward four decades, hundreds of top-tier endorsers in studios and on stages throughout musicdom, as well as the production of hundreds of thousands of drums and accessories, and today Tama is one of the biggest drummakers in the world. …Tama is applying its four decades of high-quality drum-making expertise to the marching drum market. 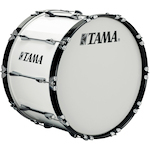 Tama intends to serve marching percussion artists by solving the design problems left unaddressed by the status quo equipment makers. 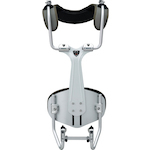 These solutions will maximize the drummer's comfort, safety, and performance, contributing to a richer performance experience. 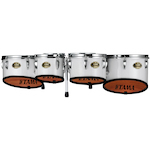 Over the last three years Tama has been busy fulfilling their commitment to turn the marching percussion world on its ear, drum line, by drum line. Word has spread… from high school programs to some of the most prestigious bands in the U.S., like "The Crew" at the University of Pittsburgh,The U.S. Air Force Academy Drum and Bugle Corps., The University of Hawaii, The Spirit of Houston Cougar band at the University of Houston and The Blinn College Buccenners. With so many common-sense solutions to age-old equipment problems, the drummers at Tama can't wait to show you what the drums of tomorrow look like.